Studio 22 is about pushing the boundaries and being inventive with knitwear, by using simple techniques to produce striking results. 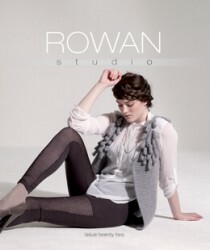 Rowan Big Wool, Kid Classic, Kidsilk Haze and Felted Tweed Aran are combined to create a variety of dramatic effects. Tubular and three dimensional knitting, laddering and felting are a few techniques used to create this exciting collection. This issue is for the adventurous knitter!